A 10K PR at the 3-2-1 Loop Race! 6 laps, 1.03 miles each. 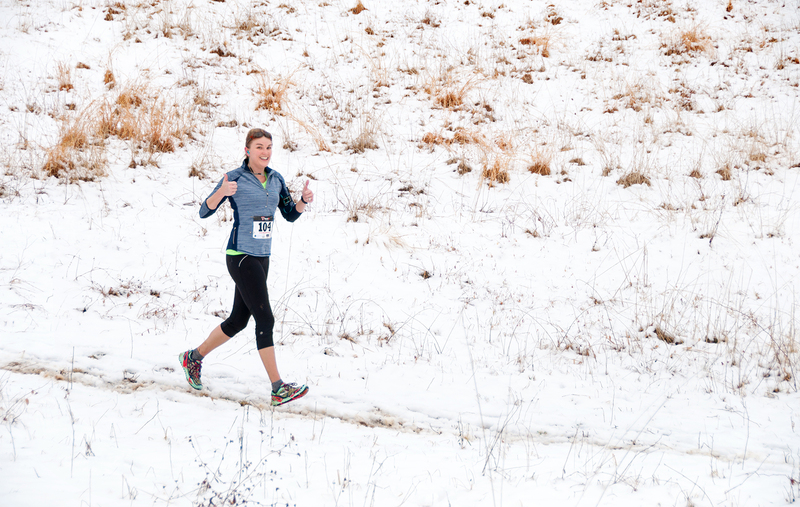 That pretty much sums up last Saturday’s 3-2-1 Loop Race. Well, that and the fact that I ran a huge PR!! The concept of the Loop Race was simple: runners could either compete as part of a 3-person relay (running 3, 2, and 1 laps) OR as individuals in the 5K (3 laps) or 10K (6 laps). I signed up for the 10K option two days before the race and I sure am glad that I did!! 6 laps, 1.03 miles each. For many runners, that actually sounds unbearably boring. The repetitive nature of this course was certainly daunting, but it allowed me to treat this 10K like a drill. I wanted to run a more consistent, even pace (my splits are usually all over the place) and also planned to be very strict with myself about not going out too fast in the first mile (an all-to-common occurrence for me in shorter races). I reminded myself of my mantra from last year’s Broad Street 10 Miler: You can’t win a race in the first mile, but you can definitely blow it by going out way too fast!! This recap is long so allow me to spoil the ending… I didn’t go out too fast and I totally PR’d!!!!! Also, my bright orange shirt makes my arm look radioactive. At 9AM sharp I crossed the start line with a mixed field of relay runners, 5K-ers and 10K-ers. My goal for the first mile was a very conservative 7:58. (By comparison, in the previous week’s 5K I went out in 7:24!) I felt like I positively crawled through this lap and I had to check my watch multiple times to remind myself to slow down. Finally with the start line in sight my watch beeped 7:45 — not too far off my goal — and I continued into Loop #2. 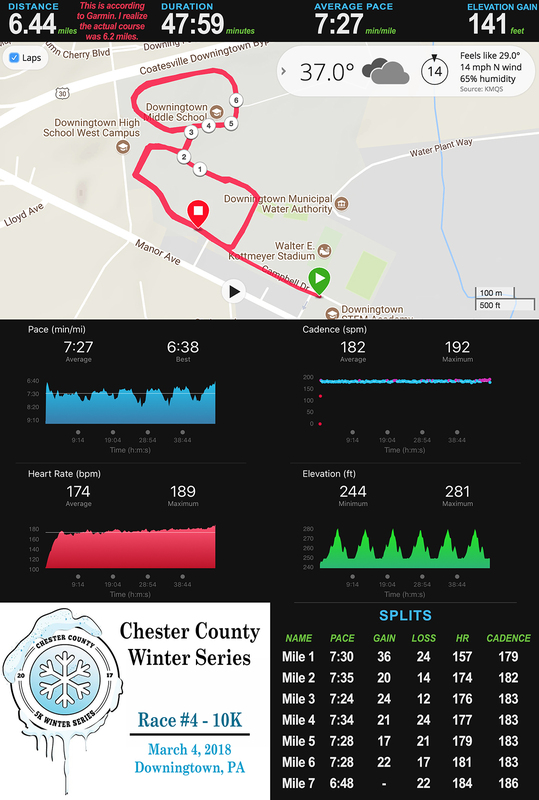 Each 1.03 mile loop made a circuit around Downingtown West High School and Middle School. The middle school sits about 24 feet higher than the high school, so during the first half of each loop we’d gradually climb a slight incline, and then we’d get to descend back down to complete the lap. I liked that the downhill was in the latter part of the lap since it helped me get some momentum going into each mile split. Before I knew it my second mile was over in 7:37. My third mile felt routine. Sure, I was running hard, but I was also making sure I didn’t push too much since I still had three more 1.03 mile loops to go. When my watch beeped a 7:39 split I didn’t think much of it, but then I turned the corner towards the start/finish line and saw the race clock. For 5K runners this was the finish line and I breezed through in 23:21… just FOUR SECONDS off my 5K PR! Prior to this race I had only ever completed one road 10K: the hilly Double OyVey 10K last October. I believed that I was capable of bettering my OyVey time of 49:50 but the question was, by how much? After seeing my 5K split I realized that I definitely had the 10K PR locked up… at that point even a 26 minute 5K would get me across the finish in under 49:50! Now it was up to me to maintain my speed through three more laps. During laps 4 and 5 I felt like I was stuck in an uncomfortable, never-ending holding pattern. I knew I was on track for an awesome finish, but it wasn’t time to get excited yet. I just had to hang on and let my legs do their job through these miles. Hang on I did, with two more sub-8 splits. During these laps I set a new unofficial 4 mile PR (30:42) and came within 2 seconds of my 5 mile PR from last December. I was on fire!!! At long last the 6th lap began. I had been passing the same spectators for the last 38 minutes and was very thankful that this would be my final time seeing them. Amusingly, most spectators had obviously become confused by the crazy relay/5K/10K mixture that was going on and had resorted to helpfully yelling “You’re almost there!! !” every. single. time I looped by. Now that was finally true!!! In the midst of the race I hadn’t figured out what time I was going to finish in. All I knew is that I was definitely going to PR and hopefully could finish in under 48 minutes. As I turned the last corner for the sixth and final time the clock came into view… it was ticking away in the 46:40s!! I ran as hard as I could crossed the line at 46:58, nearly 3 minutes faster than my previous 10K best!!! If I learned one thing from this 10K, it’s that I absolutely MUST start races slower. It seems counter intuitive, but I know I can achieve faster overall times if I begin with a more conservative first mile. Heck, apparently I can run back-to-back 5Ks in 23:21 and 23:37…. BOTH faster than the previous week’s actual 5K race. Crazy! The second takeaway is that the core strengthening that I’ve been doing as part of my new year’s resolution is definitely helping. I did not do any speed work leading up to this race, but still somehow managed to come extremely close to breaking my 5K and 5 mile PRs… both of which were set during my end-of-season peak last fall. I’m excited to see how fast I can run when I actually start “training” on the track! My first workout of the season was last Tuesday so time will tell. 6 laps, 1.03 miles each… a huge new PR and a fantastic way to kick off the spring season! 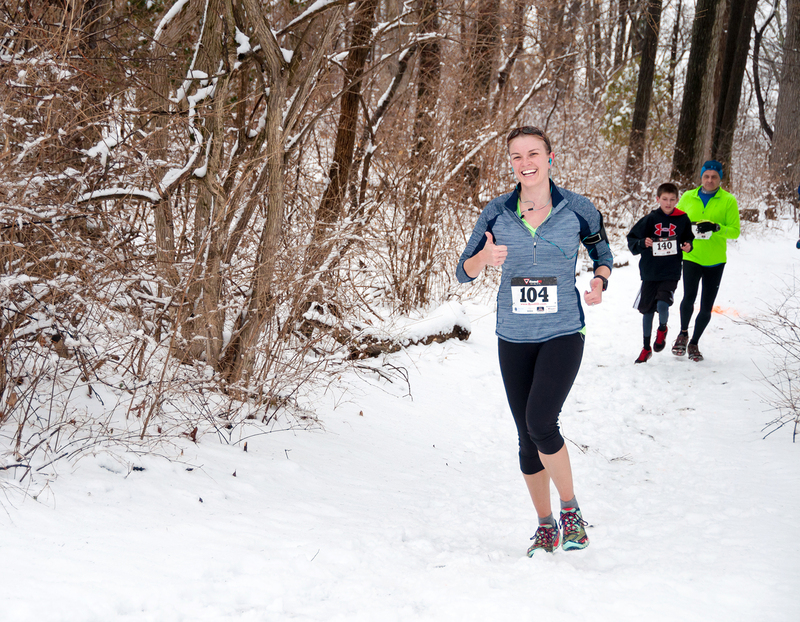 Three weeks ago I ran my first 10K on snow-covered, narrow, insanely hilly trails. It was HARD! I survived that race but met none of my goals (except finishing) and came away from it hoping that I could learn from my trail 10K experience and be stronger at the next race. Average better than 10:00/mile pace. SUCCESS!! Finish in under an hour (9:39 pace). SUCCESS!!! 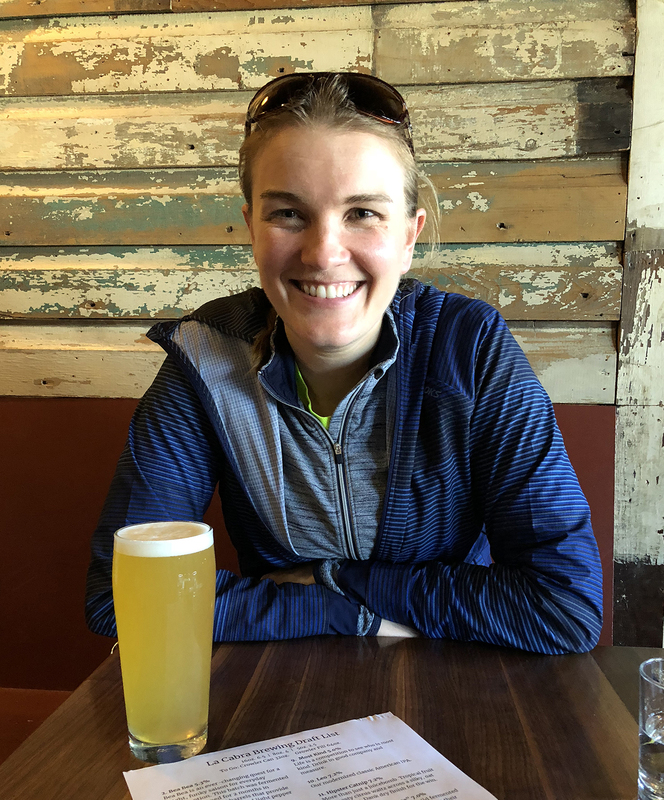 I am so proud to share that I met ALL of my goals, finishing this fun, challenging trail race with a new PR time of 58:34… 12 1/2 minutes faster than my previous trail 10K! Here I am immediately after the race when I saw my time. Woohoo! Trail Runners are really nice! During my previous trail 10K I realized that no one around me was listening to music. Instead they were politely saying “on your left” when they passed me or “nice job!” when I passed them. Crazy! 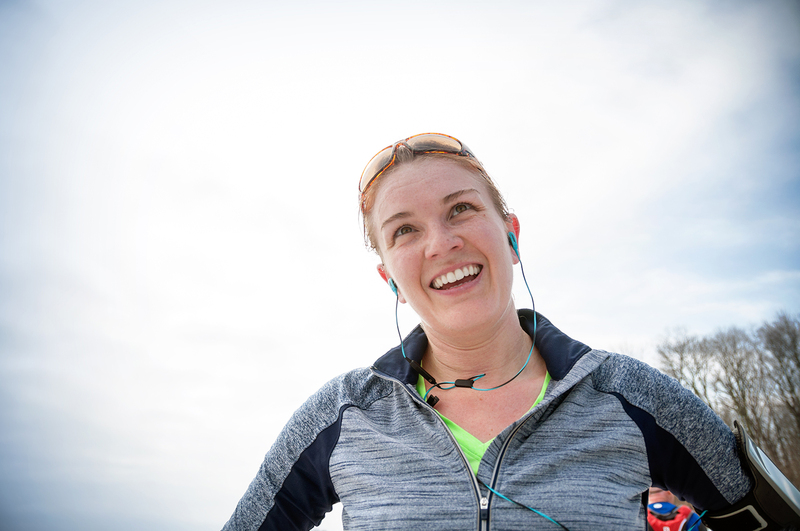 I felt like a total newbie with my iPhone and ear buds and quickly turned my music way down to better hear my fellow trail runners. During the Tyler 10K I left my phone in the car and definitely enjoyed being able to hear all of the banter around me. Runners were chatting about hills, encouraging one another, and, when two runners fell right in front of me on a downhill stretch, checking to make sure that everyone was OK and able to proceed. Trail runners are NICE!! I happily joined in on the occasional chit chat and had a nice exchange with an older guy who panted out “let’s go Pink, see you at the top!” as he passed me on a steep uphill climb. I like stream crossings. A lot! The Tyler 10K course included four stream crossings. Runners had three options: (1) be a superhuman and leap across the creek in a single bound, (2) slow down and tip-toe across some slippery rocks, or (3) run straight through the water. 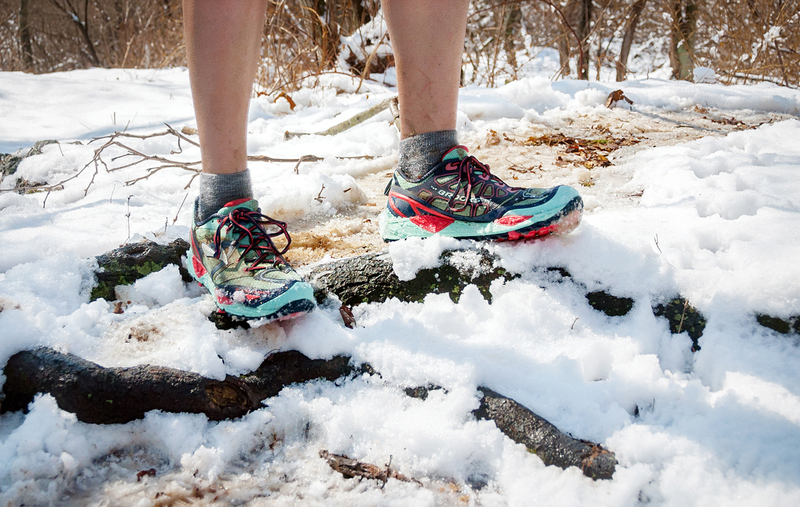 After a winter of running in snow, ice, and mud, I’m pretty accustomed to running with wet feet so I went into the race thinking that I would go with option 3… unless the rocks looked easy, in which case I’d try to stay dry as long as I could. The first stream crossing felt like it came up really quickly and before I knew it I had already swerved around a few people who were slowing down to do the rock thing. I plowed through the water and emerged on the far bank, happy and wet. 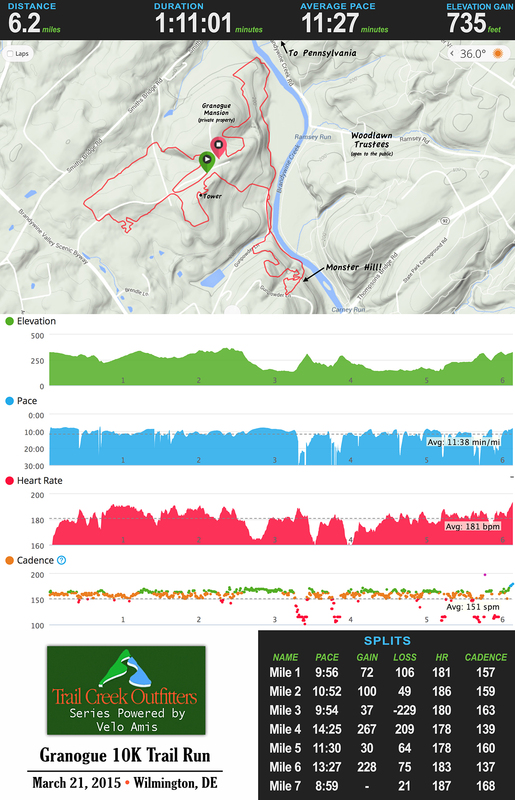 Heart Rates and Hills, oh my! I think of myself as a runner who likes, even embraces, hills. I do a lot of hill running in my neighborhood and on the trails at Okehocking Preserve and I know that even if I get really fatigued going up a hill I can usually recover quickly once the terrain levels out. Unfortunately my confidence took a big hit during the previous trail 10K when I had to slow to a walk SEVERAL times on hills, and I left that race thinking that a goal of “don’t walk” for a trail race might not be attainable for me. With that backstory in mind, I went into Tyler hoping that I could make it up the hills without walking, but completely unsure about my ability to do so. When the first major hill loomed into view after the stream crossing I looked up and saw many people walking, but I also realized that I could actually see the crest of the hill and it didn’t look so bad! I jogged up the hill, passing a few walkers in the process, and recovered at the top. Hurrah! I realize that there is a point at which it becomes more energy efficient to walk up a hill during a trail race. I’m not sure exactly where that point is for me, so I resorted to looking at my heart rate to help me determine how much effort was too much. I know that my max. heart rate during a 5K seems to be somewhere around 198-202 bpm and in a speed workout it’s not uncommon to finish each interval at around 190. I fixated on that 190 rate and checked my Garmin on uphill climbs to make sure that my heart rate stayed below that number. None of the hills were too crazy so it all worked out and I never had to walk! I am really excited about Broad Street. Many times during a hard 5K I’ve found myself thinking “Why do I race? Is this even fun? This is so HARD!” Of course, I always feel happy the moment a race ends, but my point is that racing is not always my favorite activity while the race is actually going on. So, imagine my surprise on Saturday when, at around the 4 mile mark, I found myself daydreaming about the Broad Street Run! 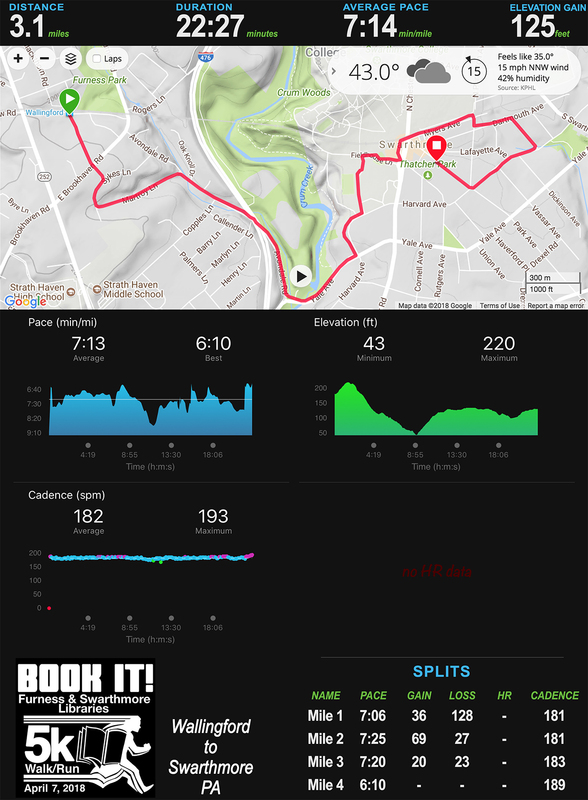 Granted, I was thinking that I would hopefully feel better at the Broad Street 4 mile marker then I was feeling at that point during the trail 10K, but overall the idea of running another 5-6 miles on pavement really didn’t seem too bad. The 10 mile Broad Street Run is 20 days away and I am pumped!!!! In the final half mile of the 10K there were two runners right in front of me: a man and a woman. I set my sights on the woman and slowly gained on her. As the finish line came into view I decided that I was definitely going to pass her (even though trail runners are really nice it’s still a race, after all!) and with a hundred yards to go I somehow started sprinting. I passed both runners and blasted across the finish line (Garmin says my pace was 4:13 at the end????!) before collapsing in a happy, tired heap. According to the official results, I finished 7th in my age group, 24th female, and 104th overall out of 388 runners! All in all, the Tyler Trail 10K was a fantastic experience. 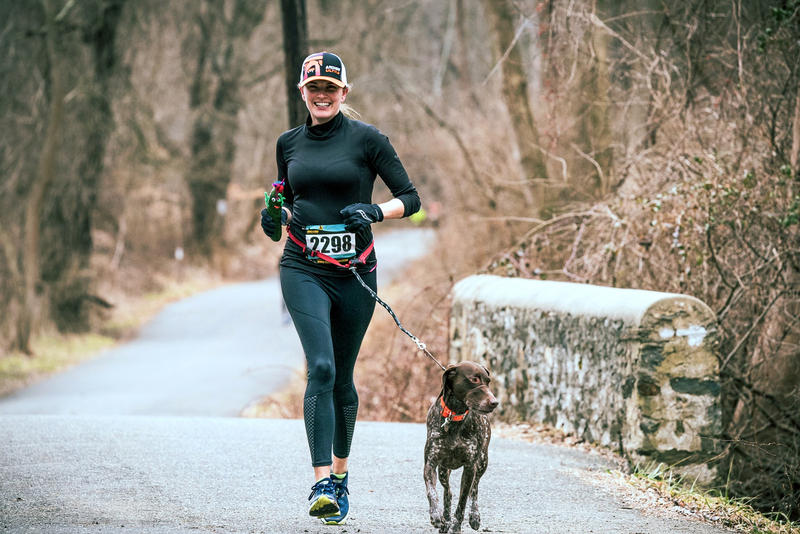 I learned that I am stronger than I thought I was, I “unplugged” and enjoyed the runners, scenery, and the thoughts rambling around in my head, and I know for sure that I’m having a blast racing! My next race will be with Matt! We’re running the Empower the Children 5K in Havertown, PA next Saturday. Then it’s on to Broad Street!! 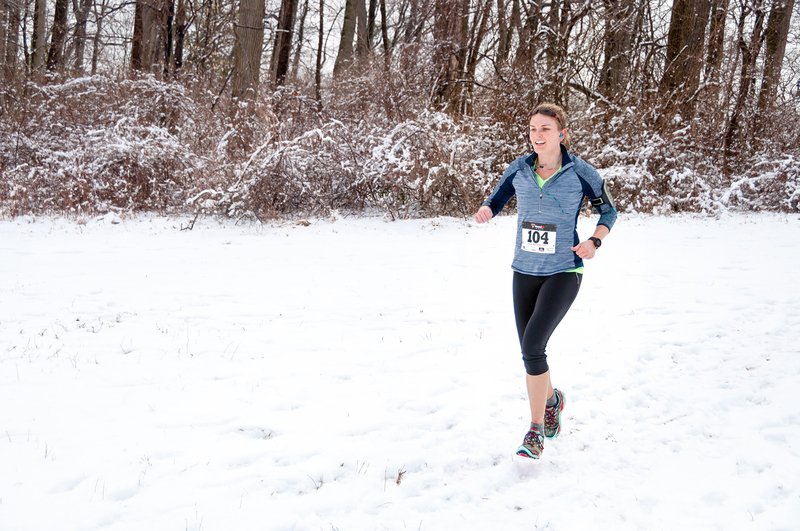 Today I learned that 10K trail races in the snow are not for the faint of heart. Or the faint of ankles, knees, or breath, for that matter. Luckily I must have just enough of each of these because this morning I finished my first ever 10K! 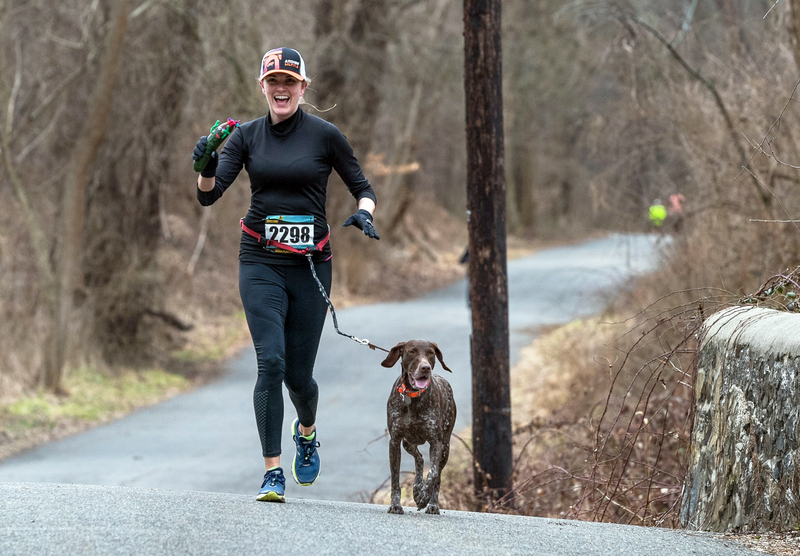 Let’s jump right to the chase… the Granogue 10K Trail Run was 6.2 miles of snowy, slushy, slippery trails with wildly steep hills and gorgeous, sweeping views of the Brandywine valley and creek. In other words, this was a hell of a race to pick as my first 10K! I had fun but MAN was it hard!! Going into the race I had a few lofty goals including (a) finish under an hour, or (b) at the very least maintain a pace under 10:00 min./mile, OR, if all else fails, (c), don’t walk. Well, let’s just say that I promptly reassessed those goals when my watch reported that it had taken me nearly 10 minutes to slog through the very first mile (usually my fastest). At that point I quickly realized that I had left out the most important goal of all: (d) finish the dang race! Finish I did, but not without a healthy dose of uphill walking. For a while I was hoping that I wouldn’t need to walk, but then the course took a sharp turn up and away from the Brandywine Creek at around the 3.2 mile point. According to Garmin this hill gained 169 feet over just 0.15 miles. A 21% grade, eek! After a short bit of slow uphill running I realized that all of the other runners ahead of me were walking and I mercifully slowed down to a power-hike-type walk where I pushed on my quads with my hands with each step. (I think I read about this technique somewhere online?). This seemed to work as I didn’t lose any ground on the hills and was able to return to a jog at the top. The course switch-backed through the woods, up and down gullies and ravines and, at one point, under what’s called “Glue Sniffer’s Bridge” (wonder what that story is?) before scaling the hill back up to the Granogue Estate. At this point my brain was fried and I was just putting one foot in front of the other… but then I saw Matt! He came to the race to cheer me on and take pictures and it definitely gave me a boost to see him standing by the side of the trail. Plus, you can’t argue with these views… Granogue Estate sits (very) high on a hill facing the First State National Monument (aka Woodlawn Trustees nature preserve) with the Brandywine Creek and a seldom-used freight train line in between. It’s beautiful here!! I’ll be racing again next weekend, but I don’t know yet if I’ll be opting for the Pickle Road or Trail course. After today pavement sounds nice, but depending on the conditions I might want a chance to redeem myself on the trails before the Tyler 10K trail race on April 11th. I’m hoping that Tyler is easier than Granogue!! !